Russian President Vladimir Putin presents King Hamad bin Isa Al Khalifa of Bahrain with an Akhal-Teke horse called Khadzhibek during a meeting at Bocharov Ruchei residence, Feb. 8, 2016. Russian president and King of Bahrain exchange presents. 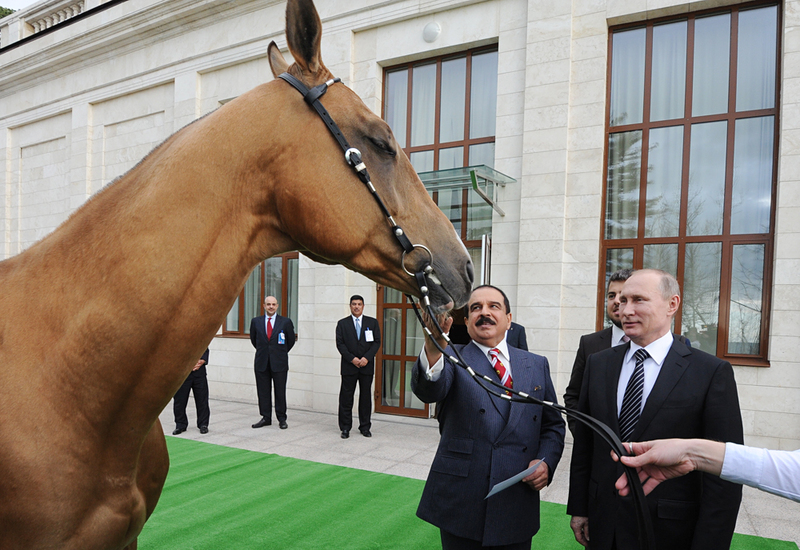 Russian President Vladimir Putin has presented the King of Bahrain with a champion Akhal-Teke horse named Hajibek. The king returned the gesture by presenting him with a Damascus steel sword, commissioned by the king for the president of Russia, the Kremlin press office said. Having received a cutting object as a present from his guest, Putin observed the Russian tradition - so as not to fall out with each other - by handing the king a coin. The sheath of the sword, named Pobeda, was made of precious metals in Bahrain. The young stallion, born in 2012, was provided by a Russian horse breeder. Hajibek won world champion titles in the breed several times: as champion in 2015, and as absolute champion and the World Champion for Young Horses in 2014. The two leaders held talks in Sochi on Feb.8, and, as the Foreign Minister of Bahrain, Shaikh Khalid bin Ahmed Al-Khalifa, said, "His Majesty thanked his brother, the Russian president, and expressed hope that Vladimir Putin will pay a visit to Bahrain in the very near future."